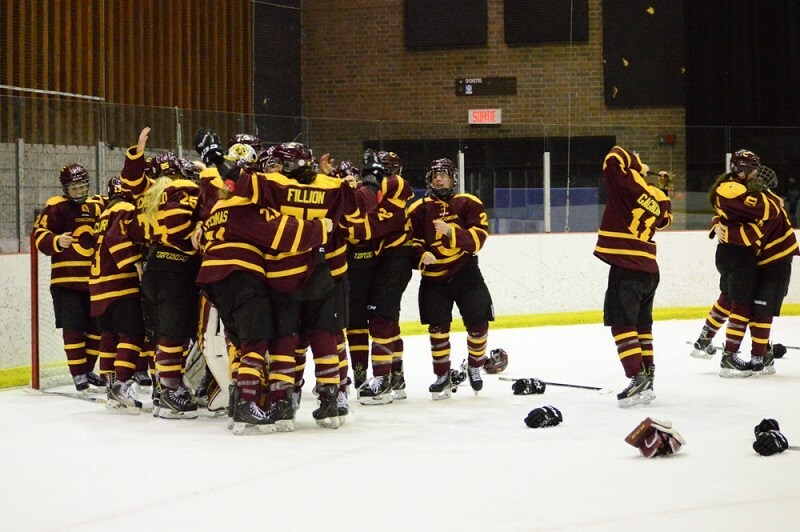 Heading into the new season, Julie Chu, head coach of the Concordia Stingers women’s hockey team, wants her players to communicate with each other. “In general, that’s an area we’re emphasizing for our team, to get the confidence from our players to be able to communicate in an outgoing and deliberate way,” Chu said. Forward Devon Thompson is the team’s new captain. Archive photo by Kirubel Mehari. Coming off a Réseau du sport étudiant du Québec (RSEQ) championship win last season, the Stingers have a new leadership group ready to carry Chu’s efforts. The players chose fifth-year forward Devon Thompson as captain, replacing Marie-Joëlle Allard, and forwards Sophie Gagnon, Claudia Dubois and Audrey Belzile as assistant captains. Fifth-year goalie Katherine Purchase was also voted as captain for a second year in a row; although she can’t wear the ‘C’ like Thompson will, Chu said she will be a leader in the dressing room. Dubois, Gagnon, Belzile and Thompson—who was an assistant captain last year—were part of last season’s top-six forward group that are all returning. Dubois led the team in points with seven goals and 13 assists in 20 games, while Belzile led the team in goals with 11. Lidia Fillion and Stéphanie Lalancette finished with 17 and 16 points respectively, and will be back for another season. The Stingers led the league with 65 goals in 20 games last season. Archive photo by Alex Hutchins. There are 12 first-year players on the Stingers’s roster, with four coming from powerhouse Cégep Limoilou, near Québec City. One of those players is forward Rosalie Bégin-Cyr, top scorer at Limoilou last season with 52 points, and winner of the league MVP. Also coming over from Limoilou is defenceman Amélie Lemay, who scored nine goals and 11 assists in 24 games last season, good enough for 11th place in the entire league. Chu said it will take some time for her to adjust to university-level hockey, but that’s normal for a defenceman. Chu hopes Bégin-Cyr and the other new recruits will contribute on offence. The Stingers led the league with 65 goals last season, an average of over three per game, and the head coach believes it’s the team’s strongest asset. Forwards Claudia Dubois (left) and Sophie Gagnon (right) are assistant captains this season. Archive photo by Mackenzie Lad. Heading into the season, U Sports ranked the Stingers as the number-one team in the country for the first time since 1999. The league ranked the Stingers number two in their original rankings on Oct. 9, but after the University of Manitoba lost two games, Concordia grabbed the top spot. The Stingers won the bronze medal at the national championships last March. Chu said she wants to make sure her players know the only expectations they should worry about is their own, and not that of the rankings. Three teams from the RSEQ were in the latest top-10 rankings from Oct. 16, with the Université de Montréal Carabins ranked third, and the McGill Martlets at the 10th spot. The Stingers will play each of those teams five times this season. The Stingers opened the season Oct. 21 with a 4-1 win against the Ottawa Gee-Gees. They play the Carabins on Oct. 26 before their home-opener on Oct. 28 against the Martlets.